Fragrant Pearl was a breakthrough in a world of winter pink luculias. The summer flowering white luculia is grandiflora (a different species), the hard candy pink form in flower now is gratissima. The most common form of pinceana is Fragrant Cloud which reaches for the clouds but has beautiful late flowers in soft almond pink with a white eye. Fragrant Pearl is white, very fragrant, has very large individual flowers and if you have a good plant, it will flower from the end of March to the end of June. It does get some size to it if you don’t keep it pruned and pinched out – as in 3m x 3m. Luculias have a wide distribution throughout Asia, including parts of China and northern India but basically they won’t tolerate hard frost and very cold temperatures, they don’t like too much heat but they are happy in moist and friable soils – which is pretty much describes the conditions in much of Taranaki. We have our colleague, Glyn Church, to thank for introducing the white pinceana luculias here. Some years ago he brought in seed and Fragrant Pearl is a selection which we purchased from him as part of that seed raised batch. It was so good that we started propagating it from cuttings (to keep it true and avoid seedling variation) and put a cultivar name on it. It roots easily from cuttings taken in late spring or early summer and grows rapidly so if you can find a plant in a friend’s garden, you can grow your own. 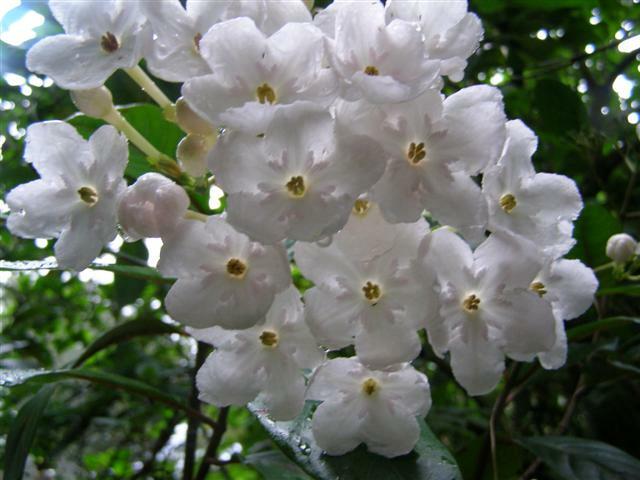 This entry was posted in Plant collector and tagged Abbie Jury, Luculia pinceana Fragrant Pearl, luculias, white luculia pinceana on 4 June 2010 by Abbie Jury.